LG has officially launched LG Q6+ in India It has 4GB RAM and 64GB of Storage. It has a 5.5 inch 2160 x 1080 pixel display with a 2:1 (or 18:9) aspect ratio and has very slim bezels. LG Q6+ is powered by Qualcomm Snapdragon 435 Processor. On Camera, it has a 13MP Rear camera and 5MP front camera.Dual SIM device runs on Android 7.1.1 Packed with a 3000mAh Battery. 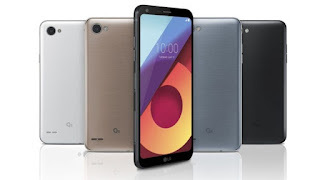 The width, length, and thickness of the product are 69.3mm, 142.5mm, and 8.1mm, The design of the LG Q6+ has also inherited the refined elegance of the LG G6. From the front, you can feel the unity of the product's rounded corners and rounded full vision corners. The backside is treated with a curved edge so you can feel a good grip when you hold the product in your hand. LG Q6+ comes in Astro Black, Ice Platinum colors priced at Rs. 17,990.users who have pre-booked the LG Q6+ also get a free LG Bluetooth speaker worth Rs 2,990 with the device. Available at offline Retail Stores.